So, I sent my brother some paper made out of Elephant Poop for his birthday. I enjoyed getting a laugh while doing some good. Thanks to Jim Toole at CAUSEdepot, I may be able to give more "good" presents for Christmas, too. At CAUSEdepot's Faith and Globalization blog, you can read some posts by two pastors, an MBA who traveled in China, a seminarian who has been to Africa three times in the past four years and a motorcycle-loving Marine who is headed back to Iraq for a second deployment. Besides making available some "good" goods, there is also a lot of good conversation. Last post I introduced you to CauseDepot, a website dedicated to "bringing global awareness to everyday living." Today, as I was drinking my morning coffee I was thinking about how (as soon as my first shipment of Firecracker Espresso Blend arrives) my daily ritual could start making just a bit of difference for good in the world. The folks at Just Coffee are a coop that works in partnership with people like the National Presbyterian Church of Mexico to address some of the root causes of migration to the United States from the Mexican side. But CauseDepot is more than just an online store. Revs. Jim and Pati Toole mean it to also be an ongoing conversation about a changing world and the impact that can be made through everyday decisions. What if we as consumers started to buy everyday products through the internet from non-profit organizations or cause-related enterprises that sell products to sustain their causes? We would actually start recycling our consumer power! This is what we are calling the CAUSEdepot. 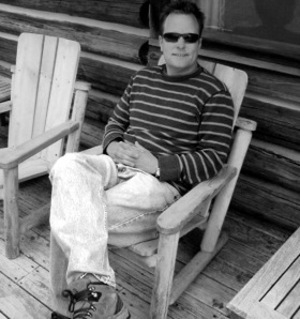 The CAUSEdepot was created by ordained pastors, Jim and Pati Toole. Our family is a fairly normal family of four. However, like many we feel an urgency to be more active in global poverty issues. We have decided to start the CAUSEdepot. It is an e-retail store, conversation, and portal to innovative ideas. It is a small way for us to enter into innovation surrounding global issues. Our desire is to showcase stories and encourage ideas of innovation and enterprise that can benefit cause-related organizations. Sixty percent of our profit will go back to other effective organizations. Jim Toole's looks can be deceiving. Behind the calm (often described as "Jedi-like") exterior lurks the heart of an entrepreneur who wants to change the world. Watch him hold a cup of coffee (usually made from beans he roasted himself after having them shipped from his favorite fair-trade co-op) and listen to the 41 year old pastor say, "I am often asked when I am going to write a book. I'm not. I'm going to come up with the next idea like 'child sponsorship', the next idea to change the way Christians can be part of changing the world." CauseDepot's purpose statement is "bringing global awareness through everyday living." At the faith and globalization blog (to which I will be a sometimes contributor), Jim will moderate a discussion on how globalization is both an opportunity and a challenge that takes some careful, prayerful consideration if we Christians want to truly make a difference for good in the world (think Thomas Friedman meets Thomas Merton). On the website you can learn about individuals and organizations that are trying to use the ingenuity of entrepreneurial thinking to bring fresh experiments of hope to the painful places in the world. You can see videos (like the Rwanda Bike Coffee Project) or read stories of individuals who are offfering small creative responses to needs in the world that could make a big difference (like Rosa Loves), or at the Ideas for Change: Entrepreneurs Against Poverty blog you can post your own brainstorming for combating poverty and injustice in the world (see the posts on Kiva or the young abolitionist Zach Hunter). But perhaps most exciting is that Jim has created an online store that only features non-profit and cause-related goods. His partners are small organizations, communities and ministries who are using their businesses to do good in hurting places in the world. Jim and Pati take a small markup from the products from the organizations to keep the site running and and then donating 60% of any profits to other causes near to their hearts. So, the indigenous organizations make a profit, and Jim and Pati generate resources so they can keep giving to even more causes. I have already bought two pounds of coffee that will be sent to my door that will help fund two partnerships seeking to make a difference in their communities through coffee production (one in Africa, one in Mexico), as well as bought my brother a birthday gift that I KNOW he won't be getting from anyone else (but which I won't tell you because it will ruin the surprise if he reads this.) But go browse for yourself. This could be the only place you shop for Christmas. Perhaps most exciting about this venture is that it is a venture. Jim is not just sitting back and writing articles, but has personally jumped into the intersection of the challenge of poverty and the opportunity of globalization through technology by offering this site as a forum for discovery AND doing something. Jim and I have talked many times about the number of young business-savvy entrepreneurial minds that we have living in a place like south Orange County, California and the huge impact that all that intellectual capital could make for further the Kingdom of God if it was only inspired and focused. Jim is being the perfect pastor and "practicing what he preaches." Through CauseDepot we can all hear the stories of entrepreneur around the world who are making a difference and in some small way, become one ourselves. Doing Good? or Doing Well? Or? It has been said that the first missionaries to Hawaii “came to do good and did very well, indeed.” While the actual facts of that sarcastic comment are disputed, it points to the tension that often comes to fore when whenever things “evangelistic” try to intersect with things “entrepreneurial”. But maybe all that is changing. A few months ago I was invited to a lecture by Thomas Friedman, author of The World is Flat: A Brief History of the Twenty-First Century. Friedman’s perspective of a world that is now so technologically interconnected that it is has the great potential to become more and more leveled intellectually and economically has caused some anxious responses. How will we Americans with our high costs of living compete in a world where cheaper and better intellectual help is just a mouse click away? When American tax returns can be completed via computer by American educated and trained Indians in Bombay who can live very comfortably on wages that are 1/3 an American CPA, college graduates see their standard of living slipping away faster than you can say “call center”. And technology is advancing so rapidly that in many places it is already rearranging the landscape in most unexpected ways. When I was in the Philippines two summers ago to speak at a pastor’s conference, every one of the pastors there were far more text-comfortable than I was. Their shaky “landline” phone system had already been for all intents and purposes scuttled for cell technology. 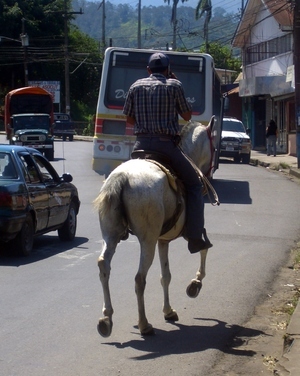 When I was in Costa Rica last year at language school, I took a picture of a farmer, riding his horse down the middle of the street on the way to market—talking on a cell phone. In the 80’s era film, Working Girl, Melanie Griffith is an aspiring business women who tries to hook up with fast-track exec Harrison Ford with the line, “I have a brain for business and a bod for sin.” The heroes of tomorrow will be those with a brain for business and a heart for justice. And tomorrow, I'll introduce you to a website that just may help us figure this out. I lost a day today. Got on a plane and it was Thursday and landed and it was Saturday. Literally changed by calendar on my watch from "10" to "12". I am posting this from an airport transfer lounge in Seoul, South Korea where I have already had two free lattes. It is 6:00 AM local time, sometime in the afternoon FRIDAY at home in the OC. In two hours I fly to Manila where I recuperate from jet lag for a day (or is it two?) and then we drive to Subic Bay for the Chrysalis Institute Asia. I was struck again by how wierd it is that I can fly around the globe, literally while I sleep (or watch "Akeelah and the Bee"--two thumbs up!). With the internet connection, I can post as easily as at home (in fact, as Thomas Friedman of "The World is Flat" fame will tell you, even easier). One other experience to "mine" for later: earlier today, I was the only "white, non-hispanic" (to use US Census terminology) sitting in a room watching the terror alert on CNN (see travel note below) There was one hispanic women, everyone else was Asian. Here's the rub. It was at LAX. I hadn't yet left the USA and was already in "foreign" ground. Even more interesting was that when I sat in the transit lounge in Seoul, there was far more English spoken than there had been in Los Angeles. While some will bemoan this state of things, I see both the reality of a changing world and the opportunities that abound. And once again, my definition for the "world that God so loves" has just gotten a bit bigger. Travel note: As most of us know by now, the days of bringing bottled water--or even hair gel--on a plane look like they are over. If you are going to buy South African--or even Napa Valley wines--you won't be able to carry them on a plane anymore. This uncertain world will require, at the very least, certainly a lot more patience.